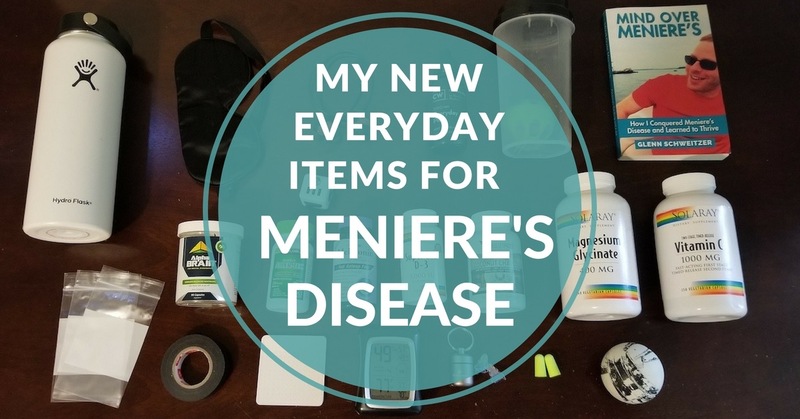 Two years ago, I published a breakdown of the products and supplements I use on a daily basis to help me live a better life with Meniere’s disease. At the time, it was an experiment – a break from the 1400+ word long-form articles I would normally post. Yet much to my surprise, it ended up being a hit! And a lot has changed since then. So today, I present you with a list of my new everyday items for Meniere’s disease. Enjoy! DISCLAIMER: I am not a doctor or medical professional. All supplements can have side effects and can negatively interact with prescription medication or other supplements. Talk to your doctor before taking any new supplement! 1) Hydroflask (40oz) – When you live with Meniere’s disease, dehydration can trigger your symptoms in a big way. So, I recently decided to get a better water bottle, and I have to say, I love this thing. Summers in South Florida are brutally hot, but the insulation on this thing keeps 40oz of water cold for up to 24 hours. It can sit in my car, in the sun, all day long, and still be ice cold! I can’t recommend the Hydroflask enough! 2) Alaska Bear Sleep Mask – It’s important to sleep in total darkness, especially if you’re a light sleeper like me, so I often wear a sleep mask. I have several, but this is my current favorite. It’s the lightest, softest, and most comfortable sleep mask I’ve tried in a long time. 4) Charlotte’s Web CBD Hemp Extract Oil (Everyday Plus Strength) – I only recently discovered CBD, but it has quickly become one of my all-time favorite supplements. It’s more effective at treating stress and anxiety than anything else I’ve ever tried, and as a result, my tinnitus seems quieter and my Meniere’s symptoms have improved. 5) Aluball Kava Maker – Kava tea is hand’s down my favorite relaxing beverage. It’s wonderfully effective at relieving stress and anxiety, and considered a much healthier alternative to alcohol. But most importantly, it doesn’t trigger my symptoms at all. The only downside was that it used to be tedious to make. But with the Aluball, I can make a cup of kava tea in less than a minute! 6) Mind Over Meniere’s: How I Conquered Meniere’s Disease and Learned to Thrive – Of course this list would be incomplete without a copy of my book! It’s a step-by-step look at my journey, and breakdown of what went wrong, what went right, and how you can find relief, too. It contains all of my strategies for managing Meniere’s disease. 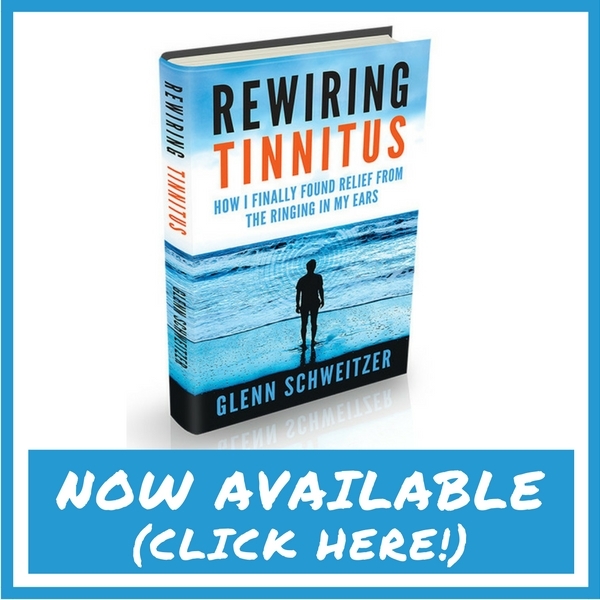 If you’ve already read it, be sure to grab a copy of my new book: Rewiring Tinnitus: How I Finally Found Relief From the Ringing in My Ears! 7) 3×5 White Block Plastic Bags – I use these plastic bags to hold all of the “just in case” medications and supplements I take with me when I leave the house. They’re the perfect size and the white block allows me to jot down notes, or label the contents. I find all kinds of great uses for these bags! 8) Onnit Alpha Brain – One of my favorite Nootropic supplements for brain fog, and the only one I feel comfortable recommending. It helps considerably for several hours. I have written extensively about Alpha Brain. 9) Kirkland Aller-Tec Cetirizine – My daily antihistamine to treat allergy symptoms. My allergies trigger my Meniere’s disease and cause terrible brain fog. Cetirizine helps to keeps it all in check. 10) Fidget Cube – This was originally a silly impulse purchase, but I love this thing! I’ve always found that I think better when I have something to occupy my hands. 11) Natrol Fast-Dissolve (Sublingual) Melatonin – I don’t take melatonin every day, but when I feel like I’m going to have a difficult time falling asleep, it helps considerably! Melatonin can be very effective as a sleep aid when used sparingly. 12) Solaray Super Bio D-3 (5000IU) – Vitamin D3 is important for many different bodily functions. We normally get vitamin D3 from sunlight exposure, but I don’t spend nearly enough time outside, so I take daily as a supplement. 13) Bulletproof Coconut Charcoal – These activated charcoal capsules work wonders helping to mitigate brain fog and other Meniere’s symptoms after eating a meal that is higher in sodium, or less healthy than I normally eat. But be careful because if you take them within two hours before or after taking any medication it will absorb the medication. 14) Solaray Magnesium Glycinate (400mg) ­– Magnesium is such an important mineral that plays so many different roles in the body, but most people are deficient, and not all forms of magnesium are created equal. Magnesium Glycinate has a high bioavailability and is what I take on a daily basis. 15) Solaray Two-Stage Time Release Vitamin C (1000mg) –Vitamin C is an important antioxidant, but when you take it as a supplement, most of it is broken down in the stomach and doesn’t actually get absorbed. This two-stage, 12-hour time release vitamin C solves the problem entirely. 16) Electric Tape – I use tiny pieces of electrical tape to cover all sources of ambient light in my bedroom, and in hotel rooms when I travel. It’s a great little “hack” to get better sleep! 17) Baron Fig “Nomad” Dot Grid Sticky Notes ­– I use sticky notes for so many different things. When brain fog can make you lose your train of thought at any moment, it’s important to write everything down. I used to use Post-its but I recently switched over to these dot grid sticky notes, as I find them better for doodling and jotting notes. 18) AcuRite Home Comfort Monitor – I live in a two-story townhouse and my air conditioner is located on the first floor. As a result, in the Florida heat, my bedroom is typically several degrees warmer than the rest of my house. And it’s much harder to fall asleep when it’s warm. I keep this thermometer/humidity meter in my bedroom to make sure it’s cool enough that I don’t have trouble falling asleep. 19) Eargasm High Fidelity Musician’s Eargplugs (Use offer code mindover for 10% off! )– Eargasm earplugs are my current favorite off the shelf brand of musician’s earplugs. They lower the decibel level of sound without muffling or distorting the quality, so you can still enjoy music and carry on conversations. I keep them with me whenever I go out. My general rule of thumb is any time I think something might be too loud, it probably is, and I put in my Eargasm earplugs. 20) Macks Snoreblocker Foam Earplugs – It might seem strange, but I go to sleep with both earplugs and my Bluetooth speaker playing nature sounds. The background noise masks my tinnitus somewhat, even with the earplugs in, and the earplugs help me to avoid distractions and get better sleep. I’m a very light sleeper, but with this setup, I can even sleep through my wife’s alarm going off at 6 am. 21) Lacrosse ball and 22) Foam Roller – Foam rollers and lacrosse balls are incredible tools for massaging sore muscles and increase mobility. Plus, releasing physical tension helps to reduce stress, which is a trigger for just about everyone. I get professional massages when I can, but I use my foam roller and lacrosse ball every single day. 23) FUGOO Style Bluetooth Speaker – I use my FUGOO Bluetooth speaker more than just about every other electronic device I own. I connect it to my phone and use it to listen to music, podcasts, audiobooks, and as a sound therapy machine while I sleep. It’s waterproof, loud, has great sound quality (from every angle), and a battery that lasts a mind blowing 40 hours at 50% volume. It’s been out for a few years now, but at $89.99 it was a steal, especially considering I use it for at least 12 hours every single day! 24) Samsung Galaxy S8 Plus Smartphone – It’s the biggest phone I’ve ever owned, but that turned out to be a great thing for me, even though it’s a bit on the heavy side. I consider the added weight a worthwhile tradeoff, as it has entirely replaced my tablet, even for reading books. But best of all, it’s the first phone I’ve ever owned with a battery life that can make it through an entire day of heavy use. 25) Mind Over Meniere’s Symptom Relief Project – My album of brainwave entrainment audio tracks engineered to help relieve some of the worst symptoms of Meniere’s disease, such as vertigo, stress/anxiety, insomnia, brain fog, and fatigue. I’ve used brainwave entrainment for a long time, way before I created this album. And today, thousands of people are listening daily, finding relief when they need it most! 26) RAV Power Portable Charger (22000mAh) – I bought this portable USB power bank last year when it looked like South Florida was going to be hit with a major hurricane. The hurricane missed us, but it ended being a great purchase. This thing can charge my phone up to 7 or 8 times, so if I ever lose power, I never have to worry about being disconnected. I always have it with me when I travel or if go out for an extended period of time. And with hurricane Harvey devastating Texas right now, I felt it was a good addition to this list. 27) Camelbak Podium Big Chill Insualted Water Bottle (25oz) – This is my go to water bottle for any kind of exercise. It has a smaller capacity than the Hydroflask and doesn’t keep water cold for nearly as long, but it’s much easier to use and it’s also much lighter. I originally purchased it for my bike rides, as it’s sized for a bicycle bottle cage. But it works really well for all types of exercise. The high flow water valve allows you drink quickly, and the insulation is more than enough to keep my water cold during longer workouts. I’m glad you found it useful Deborah! If you have questions about anything, feel free to ask! Glenn, you are super! Thank you for the tips! You tipped me on CBD oil, I can’t express enough of gratitude for that. While I am still working on the dose, I intend to stick to it as “CBD works by accumulation and saturation into the system, where it is stored in fat cells and acts on specific cannabinoid receptors within the brain and body. By doing this, it can help bring individual systems that are “out of balance” so to speak back to homeostasis”. I am using an airplane sleep mask which is not working for me as it slips and was wondering what else should I try. “wireless head phones”…not sure that Dr. Jack Kruse would approve. I am certainly going to employ few of your tips listed. Thanks! Barf bags. I carry a barf bag everywhere I go since my severe episodes are unpredictable and always result in vomiting. I also carry a card identifying myself as a Ménière’s patient and listing my husband’s cell phone number. Glenn, thanks so much for the tips. I will definitely be looking into many of them. I’m grateful for your willingness to share. It makes a newbie to this feel a lot less overwhelmed. Thanks a ton! Excellent Tips! I don’t have Menieres but this is exactly the things I seek for concussion, vestibular migraines, and fibromyalgia. I’m off to make a few more purchases! Love the back tape idea! I’d like to see others offer a few additional tips, like a moist heating pad, epson baths, good pair of sunglasses, quality essential oils ( frankincense, peppermint, lavender, wild orange) ,….. I’m sure this would be very interesting! Perhaps a “Coping with Body Sensitiivies” book! Great list. Feel like I may get all on the list. Hi Salpi, as I mentioned in the disclaimer, many of these supplements can interact negatively with prescription meds so you have to talk to your doctor first. Kava is one such example, as it can interact with several different medications. I’m not sure about CBD either way, so please talk to your doctor before trying anything on this list! Those headphones and tea are almost certainly triggers. One day you will connect the dots. A small speaker is better but, low volume and place across the room. Not close. Even over supplementing can be a trigger. Supplements, unless prescribed by a medical doctor, are just a waste of money. Just eat a healthy and balanced diet, try to get some sun each day for vitamin D, and avoid sodium level spikes. I understand where you’re coming from. Keep in mind, I’m not suggesting any of this for other people, this is just what I use. As far triggers, none of these things are triggers for me. Remember, everyone experiences Meniere’s differently, and no two people have the same triggers. What are the earplugs for? my doctor said it was no use for Menieres, but is it just to help the brain and ears rest? I think the eargasm earplugs might help me to enjoy the same music as the rest of the audience. I have been through at least 3 different kinds of varying expense with earplugs, to no avail, as they ruin the sound experience. Concerts, sports events, & church services are punishing sound, with all the amplification & high decibels, really hypes up my hyperacusis. Glenn, thank you so, so much for all your efforts helping those of us with Meniere’s. I’m grateful I found your website and your FB page, where I can engage with other members. You’ve made a positive difference in my life and everyone else’s who suffers from this complicated, hard-to-treat disease. Blessings!